Posted by ajoyfulpractice in 31-Day Challenge, Books, Buddhism, Changing Perspectives, Depression, Donate, Faith, Gratitude, Healing Stories, Health, Hope, Karma Yoga, Life, Loss, Love, Men, Music, One Hoop, Pain, Peace, Philosophy, Poetry, Suffering, Super Heroes, Surya Namaskar, Twin Cities, Uncategorized, Vairagya, Volunteer, Wisdom, Women, Writing, Yoga. Even though I’m running behind and posting this super late on April 20th, what is true of today was true of yesterday: We lost somebody, somebody we should never forget. We could go back as far as April 19, 1506 (to the Lisbon Massacre) or April 20, 1916 (to the Ludlow Massacre) and 1945 (to the Neuengamme / Bullenhuser murders) – or as recently as April 19, 1993 (to the Branch Davidian siege in Waco, TX) and 1995 (the Oklahoma City bombing) or April 20, 1999 (to the Columbine High School massacre): Either way, we lost somebody…somebody who should not be forgotten. Obviously, and unfortunately, I’m leaving some people out. I’m leaving out the 47 sailors killed when a gun turret exploded on the USS Iowa on April 19, 1989. I’m leaving out David Beverly who was killed in a shooting at Johnson Space Center on April 20, 2007. I’m leaving out people killed on April 20th in an explosion (2010, Deepwater Horizon accident), a plane crash (2012 in Pakistan), an earthquake (2013 in China’s Sichuan province), and a bombing of a UN convoy (in Garowe in Samolia). That’s over Four hundred, forty-six people I was going to leave out, but didn’t…and yet, I’m leaving somebody out, somebody we need to remember. Poems are a way to tell a story, to send a message, to inspire, to remember. They can be historically accurate – or not. They can rhyme – or not. They can be laugh-out-loud funny or satirical – or not. The can be somber and serious – or not. They can be visual and/or repetitive – or not. What is a poem if it can be all of these things? According to one definition from the Oxford Dictionaries, a poem is “both speech and song that is nearly always rhythmical, usually metaphorical.” Another definition, also from Oxford Dictionaries, says that it is “something that arouses strong emotions because of its beauty.” Meaning that maybe somebody, and their life, can be a poem. 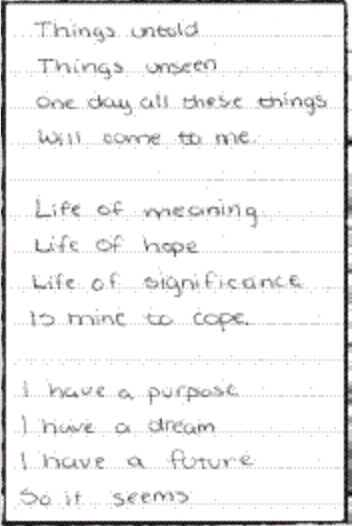 Rachel Scott, age 17, loved poetry. She was also the first person shot in the Columbine High School. Neither of those facts are the most interesting part of her too short life. It is likely that had she lived there would be a whole litany of things that made her life interesting; however, given the facts, one of the most interesting things about Rachel is how she lived…and how she is remembered. Rachel was buried in a casket covered with the words of the people who knew her. Mixed in with the typical condolences were messages of love and gratitude. Rachel was a firm believer in compassion and unity, and what struck her parents after her death was how many people gave thanks for the brief amount of time they knew Rachel. In an effort to continue her legacy of positivity and inclusivity, Rachel’s father and step-mother started Rachel’s Challenge, a non-religious, non-political, non-profit organization dedicated to reducing violence, bullying, and teen suicide. Practicing yoga, physically as well as philosophically, creates plenty of opportunity to offer yourself self-compassion, but it also taps into a wellspring of compassion you can offer to others. Remember every time you bend over backwards for someone, you are opening your heart for them. The chain reaction starts with you! Standing on your hands and knees, give thanks for the support and start to consider how you can engage on the inside to lessen the stress on the outside. Bring your big toes to touch and spread your knee as wide as feels comfortable. Play with the position of the knees and then sink the hips to the heels and lower the forehead and nose to the mat. This is Child’s Pose (Balasana). Notice the sensation of being supported – how the body rests between or on the legs, how the breath deepens. Make sure your knees are comfortable. You can always place a cushion under the knees, under the hips, or under the chest. Be grounded in order to create more space. Bring awareness to your hands and feet. Now, reach the hands and feet further away from each other (without changing the overall position of the body). Inhale to lengthen the spine and then exhale the back knee to the mat. Give yourself cushion under the back knee, as needed. Pressing down evenly into both feet, lift your torso up and place hands on your right thigh for a variation of Crescent Lunge (Anjaneyasana). This pose is sometimes referred to as “Anointed Warrior,” indicating the warrior is blessed, prepared, and ready. Consider how it feels to be anointed by love. Exhale and step the right foot in between your hands for Low Lunge. If the foot needs help reaching the space between the hands, lower the back knee so that you can use your hand to scoop the leg forward. (NOTE: Never go back with the hands, as this will cause you to crawl off the mat as you move through the practice.) Take a deep breath in to extend the spine and then use the exhale to heel-toe the right foot towards the right. At the same time you are creating space for the hips, lower the back heel down to the mat (even if that means you have to step the back foot up). Remember, the hips will go where the toes point them; so, place your feet in the position that allows the hips to be parallel to the short/front edge of your mat. One your feet are flat on the floor, inhale your arms and heart up for Warrior I (Virabhadrasana I). Let your hands melt down if you are manually adjusting your hips. As you inhale, isometrically squeeze the thighs towards each other. As you exhale, use the front foot and leg to push the front hip back. Use the back foot and leg to push the back hip forward. Press down to inhale arms and heart up. Make sure the sits bones are pointed down. You can even repeat the earlier hip adjustment from Crescent Lunge/Anointed Warrior. Engage your locks (bandhas). Notice how it feels to be a Warrior ready to answer the call to action. After several breaths, exhale hands to the mat and adjust the feet so that the right foot is more centered and the left foot is parallel to the short edge of the mat. You may need to heel-toe the left foot further away (front to back) from the right foot, but once your right heel lines up perpendicular to your left arch, inhale blossom or cartwheel your arms and heart up for Warrior II (Virabhdrasana II). Arms will end up in the letter “T” position, with the hips and heart open to the long edge of the mat. Bend the right knee as close to 90 degrees as you are able to get it, but keep the weight balanced between both feet, both legs, and both hips. You may feel a tendency to put all the weight and effort into the front foot and leg; but find the place where you feel balance. Make sure your sits bones are pointed down between the ankles. Engage your locks (bandhas). Notice how it feels to be a Warrior balanced between the past (the left arm and leg), the present (the heart), and the future (the right arm and leg). After the second set of Warriors I+II and Dog poses, inhale to Plank Pose or Cow Pose and lower all the way to the floor on the exhale. Point the toes behind you and, with hands by your hips, reach the fingertips in the same direction as the toes. As you inhale, lift your gaze, lift your heart, and lift your arms. As you exhale, lift your legs. This is a variation of Locust Pose (Salabhasana). If there is pain or discomfort in the low back, bring the feet back to the ground and actively press them down to support the heart lifting up. Consider stretching the arms out wide. Now, lower down onto your back (with gratitude) for Corpse Pose (Savasana). Find a place where your body and mind can be still. Breathe into the space between your soles, your heart, and your soul. Follow the breath into your heart and follow the breath out of your heart. Click here for more information about Rachel’s Challenge. If you or someone you know is struggling emotionally, please call 1-800-273-TALK. Posted by ajoyfulpractice in 31-Day Challenge, Art, Books, Changing Perspectives, Confessions, Depression, Dharma, Donate, Faith, Fitness, Gratitude, Healing Stories, Health, Hope, Karma, Karma Yoga, Life, Loss, Love, Mathematics, Meditation, Men, Minneapolis, Minnesota, Movies, Music, Mysticism, Pain, Peace, Philosophy, Science, Suffering, Super Heroes, Tantra, Texas, TV, Twin Cities, Vipassana, Volunteer, Wisdom, Women, Writing, Yoga. It’s that time again! Spring? Yes, but also it’s time for Kiss My Asana. For the fourth year in a row, I am joining joyful yogis everywhere to raise awareness and resources for Mind Body Solutions and their adaptive yoga programs. Matthew Sanford and the other teachers at Mind Body Solutions are committed to a yoga practice which “transcends ability and disability, opens people’s lives to new possibilities, and transforms the delivery of health care.” The annual yogathon is a virtual four-week challenge open to anyone, anywhere, and it’s pretty much open to any way you want to do more yoga, learn more about yoga, and share more yoga. Then let’s get started. There are a lot of ways to help raise awareness and resources during the month of April. Here are just a few suggestions. Since my previous Kiss My Asana offerings are still available, you can participate in this April’s yogathon by practicing “30 Poses in 30 Days” (posted in 2014); use the 2015 “30 Songs in 30 Days” as your practice playlist; add one of these 5-minute yoga or meditation practices to your weekly/daily routine (posted in 2015); and/or revisit last year’s yogi videos and profiles (featuring 5 practice focused questions). If you join the “A Joyful Practice” donation team, you will receive a studio passport which will enable you to practice at participating passport studios for free. You may also use the joyful link above to donate to Mind Body Solutions and the 2017 Kiss My Asana Yogathon (without committing to raising additional resources). You can attend one or more than one of the donation-based yoga classes being offered during Kiss My Asana. Erika Peterson will host a KMA donation-based class at Nokomis Yoga on Sunday, April 9th. I will host donation-based classes at Flourish on Saturday, April 22nd (6:30 PM – 8:00 PM) and at Nokomis Yoga on Saturday, April 29th (3:30 PM – 5:30 PM). For more opportunities, check out KMA registered classes for 2017. You can challenge yourself by practicing one thing (an asana, pranayama, or a meditation) every day for 30 days. You can use yoga to embody your favorite story, song, emotion, poem, prayer, visual art, person, or moment in time. You can blog, tweet, instagram, or Facebook link about how your yoga practice on the mat transforms your experiences off the mat. Good question. As you may have noticed (especially after last year), I love questions. I’ve fallen for “Questions” by R. S. Thomas and, like the Creed song quoted above, my personal playlist currently features question-centered songs by Fink, X Ambassadors, Ed Sheeran, Cole Swindell, and Garth Brooks (naturally)! Oh, and did I mention that questions led me to yoga teacher training? When I started practicing in Texas, I often encountered people whose only intersection with yoga was me. These people had questions – lots and lots of questions. I, unfortunately, had no answers…other than telling people they could come with me to practice. When some of my teachers suggested teacher training, I thought, “Sure, someday. Then I’ll know some answers – or, at least, know a resource where someone could live (or practice) their way into their own answers.” Flash forward to “someday” and I’m in Minneapolis attending a teacher training focused on teaching people how to teach – and everybody had to teach. So, last year I asked people questions. This year, you get to ask me questions. Answer word count will be divisible by 108. Want to ask me a question? You can make a comment below, ask me before or after a class, or send an email to myra at ajoyfulpractice.com. Subscribers to ajoyfulpractice.com will receive my answers as they are posted – or, you can check back here throughout April. Posted by ajoyfulpractice in Changing Perspectives, Confessions, Dharma, Faith, Fitness, Gratitude, Healing Stories, Health, Life, Love, Music, One Hoop, Philosophy, Science, Super Heroes, Wisdom, Women, Yoga. Posted by ajoyfulpractice in Art, Books, Changing Perspectives, Confessions, Dharma, Donate, Faith, Fitness, Gratitude, Healing Stories, Health, Hope, Karma, Karma Yoga, Life, Love, Men, Minneapolis, Minnesota, Movies, Music, Mysticism, Pain, Peace, Philosophy, Religion, Science, Suffering, Super Heroes, Texas, Tragedy, TV, Twin Cities, Volunteer, Wisdom, Women, Writing, Yoga. If you had asked me, years ago, what I admired and found so endearing about a certain friend of mine, I would have floundered a bit. Oh, it wasn’t that I couldn’t have come up with hundreds, maybe thousands, of platitudes – after all, she’s authentic, fun and funny, quirky, one half of an amazing couple, emotionally intelligent, beautiful and strong, driven, unexpectedly deep, full of grace and love …. See, the list goes on. No, the issue wouldn’t have been finding words to describe Amber K. (Yogi #27); the issue would have been capturing her essence. The issue would have been describing the multidimensional heart beneath the surface. People back in 1941, had some of the same concerns we have right now: debates over gun control and birth control; struggles with equality in the work place; war around the world, especially between people with different ethnicites and religious beliefs; politics and economy being driven by the war efforts; and immigration issues related to the war. The list goes on. What’s different, perhaps, is that towards the end of 1941, psychologist William Moulton Marston, inspired by his two wives, gave the world the hero they so desperately needed: Princess Diana of Themyscira, aka Diana Prince, aka Wonder Woman. She was a role model – not just for women, but for everyone. NOTE: The original Wonder Woman was not born an American, but she defended the United States and all its inhabitants. She had a strong relationship with the divine – which was the source of her powers. She was so dedicated to the truth that she had a “Lasso of Truth” – along with a healthy physique, indestructible bracelets, and a tiara (cause, duh, princess). I’m pretty sure her invisible plane had a nonexistent carbon footprint. And, unlike other classic superheroes, she wasn’t from outer space – or tasered by an alien race, she wasn’t poisoned by something (like a radioactive spider), she didn’t have mutant DNA, and she wasn’t driven by childhood traumas or struggling with dark triad psychosis. Wonder Woman was just all human – unapologetically strong, fierce, proud, beautiful, intelligent, humble, and compassionate. When she faced challenges (like losing her powers) she found a solution (learning martial arts). She focused on restoration rather than retaliation and believed people could be redeemed. If you look at Amber K. and see Wonder Woman, you’re getting closer to the truth. I’m convinced Wonder Woman was a yogi. Look at the evidence: She consistently exhibited strong mental focus and clarity, plus her agility was a sign of balance between strength and flexibility. Also, her capacity for turning loving-kindness into a game changer was reminiscent of the siddhis (so-called “supernormal powers” outlined in Patanjali’s Yoga Sutras). Finally, consider how the world would be a really different place if more of us interacted with each other the way Wonder Woman interacts with the people around her. By the same token, Amber K. is a verified yogi as well as a belly dancer. She is generous with her comments – both positive and negative – in a way that is constructive and insightful. She works with and around her limitations with grace – never complaining, always breathing through what comes up. Her interactions with herself and the people around her imply a certain level of respect for herself and the people around her. Her personal and professional interactions also require a certain level of awareness about the rhythm of life, how things ebb and flow. I guarantee you, the world would be a really different place if more of us related to each other the way Amber K. relates to the people around her. Amber K. is one of those people who consistently reminds me that we don’t have to stop practicing yoga just because our bodies and minds (or even our personal situations) change. But, changes in our mind-body may sometimes require a change in the way we practice. And, ultimately, that’s the beauty of yoga: it meets us where we are, accepts us as we are, and embraces all that we are. Mind Body Solutions and the KISS MY ASANA yogathon raise awareness about the fact that our physical practice of yoga can change to accommodate our needs. If we (or a teacher) have the knowledge base to change and grow within the practice our yoga practice will advance – which doesn’t always mean we’re doing more “advanced” poses. Sometimes the challenge is accepting our limitations with grace. Sometimes, to get the most benefit out of the pose (and our practice) we have to fully commit to the modification. William Moulton Marston said, “Every crisis offers you extra desired power…. Besides the practical knowledge which defeat offers, there are important personality profits to be taken.” Our time on the mat allows us to cultivate life skills we can use off the mat – but, here again, we have to turn inward and be honest about what we find. We have to keep moving, keep breathing, and keep flowing. A big giant thank you to the 15 yogis who held the space and shared the practice my donation-based KISS MY ASANA class on Saturday, February 27th(details coming soon). If you’re interested, there are still spaces available for March 5th (6:30 – 8:00 PM at Flourish). Contact Myra at a joyfulpractice.com to reserve a spot (or two). Space is limited.